Even though you have all three Pendants, you can't just storm Agahnim's Tower and take him on. You need to do a little bit of prep work first. Let's get started. You have heard the tales of the power of the legendary Master Sword, and you know that you need it to fulfill your quest. 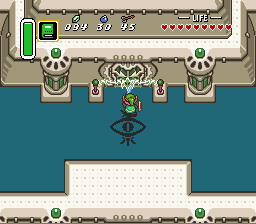 Back in the time of the Imprisoning Wars, the people of Hyrule had forged a Sword that could withstand the forces of magic. One had to be pure of heart to wield the blade. Sahasrahla, the village elder, instructed you on how to obtain the Master Sword. He said that only a hero who collects the three Pendants can take the Master Sword. You may have encountered the Master Sword in the Lost Woods before you collected every Pendant. It is planted in a stone with mysterious Hylian script on it. 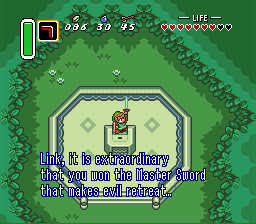 After defeating Moldorm in the Tower of Hera, return to the forest grove and claim the Master Sword. Now you can continue with your quest to seek out and destroy the evil power in Hyrule Castle, the wizard known as Agahnim. 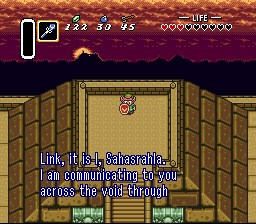 The message on the Hylian Monolith at the top of Death Mountain, to the west of the Tower of Hera, instructed readers to return with the Master Sword. Now that you have the blade, you may wish to return to the Monolith to heed the advice. 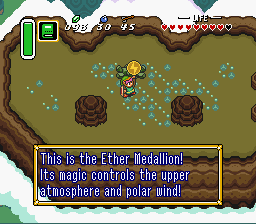 Return after your visit to the Lost Woods, and the monument will yield up the powerful magic of the Ether Medallion. After that, the monument will crumble. You will use the magic of Ether to open dungeons in later stages of your quest. Early in your adventure, you stormed Hyrule Castle to save Princess Zelda. During that time, you may have discovered a door on the roof that was barred by a bolt of lightning. Any method that you may have tried to break the Lightning Lock failed. Now that you have the Master Sword, you may have better luck. 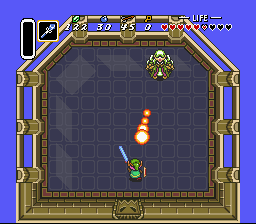 If you strike the Lightning Lock with the Master Sword, the lightning will vanish and Aganhim's Tower lays open. Sahasrahla dared you to retrieve three Pendants. Each was guarded by a fierce creature, so the challenge was not to be taken lightly. Sahasrahla rewarded you when you returned with the first Pendant by telling you about the Master Sword, which only proven adventurers could wield. 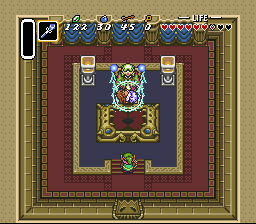 Once armed with the Master Sword, you can challenge Agahnim in the Castle Tower. 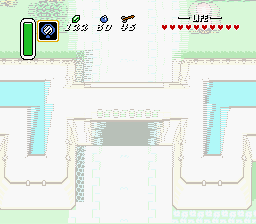 The entrance to the castle tower is sealed with a force field that only the Master Sword can break. 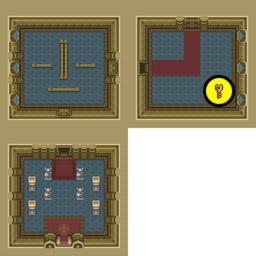 After destroying the Lightning Lock, you will step into the tower, with an ornately decorated entrance hall. What lies beyond the door on the opposite side of the entrance isn't as pretty a sight. When you enter the room above, you will be greeted by two ball and chain guards. You're much more powerful since the last time you faced one of these types of soldiers, back when you rescued Princess Zelda. Equipped with the Master Sword, you can make quicker work of these two. When they are both defeated, the door on the right will open. In the next room, you will face two guards armed with a sword. They will charge at you as soon as you enter the room. The door above is locked, so you have no choice but to defeat the guards. When you do, a treasure chest will appear that contains a Small Key. Grab the key,open the door, and climb the stairs. Upon your arrival, you will see another guard, and a strange one-eyed bat known as a Chyasuba. They're not much more of a threat than ordinary Keese bats, so take them out, and advance to the room on the left. The next room will be pitch black unless you find a torch and light it with your lamp. It would be a good idea to do this as quickly as possible. There are a number of armed guards and more Chyasubas in the room. Many of the jars of pottery that you find will contain hearts or magic. Continue to keep the room lit as you fight and advance through it. Off on the left side of the room is a treasure chest that contains the Small Key that you will need to open the lower door in order to escape. The door through which you entered locks shut behind you, and the only way to open it is to push the block that is all the way at the bottom of the room, but there's no reason to turn back now. Grab the key and open the lower door. In the next room, there are simply two armed guards to contend with before you begin climbing the stairs at the top of the room. In addition to the regular sword soldier that you encounter upon reaching Floor 4, there is another soldier armed with a bow. You'll have to fight them one at a time, since the sword guard insists on fighting at close range and the bow guard tries to fight you from far away. Remember that your shield can deflect the arrows. Head through the open door on the left. Another long darkened room, this room is loaded with gaps throughout the floor. If you don't watch your step, you will fall off a ledge and lose precious health. Light torches in order to help you find your way through the room. There are three armed guards to deal with, each separated by enough distance that you can encounter them one at a time. The pottery also tends to be useful. If, for whatever reason, you actually need to open the locked door that you came through, the block at the very top can be moved to open it. When it's safe exit through the top right door. You will now face one sword guard and two bow guards. The two bow guards may try to surround you on either side. You must fight and defeat each of the guard until one of them drops the Small Key that was in their possession. When you have it, you will be able to unlock the door up above, and climb the stairs behind it. Once you reach the next floor, you will see two Chyasubas and two red armor spear knights. You must defeat all of them in order to open the door on the left. The bats are easy to remove, but the spear knights are a lot tougher and take more hits to defeat. Defeat them and pass through the left door. In the next room, you will have two more spear knights to fight. They can be separated from one another thanks to the barriers present in the room. Try to corner them and hit them in rapid succession so that they don't get a chance to fight back. When they are defeated, the door below will open up. Pass through it. You will be trapped once again in this room. There are two Chyasubas and two spear knights. The bats can fly throughout the room unhindered, so be prepared to attack them when they get close. The knights on the other hand are bound to certain areas thanks to the blocks and the pottery. Attack them one at a time. The knight in the center of the room holds a Small Key. Defeat him to claim it so that you can open the door to the right. 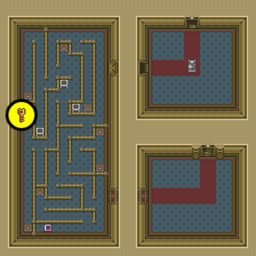 The jars in the room also contain a good amount of arrows, bombs, Rupees and hearts. Try to save claiming them until you are done fighting. 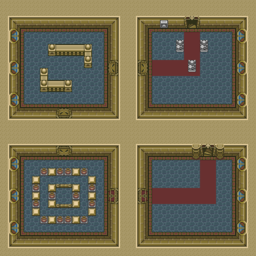 In the last room of Floor 5, you will encounter three different varieties of knight, the blue sword knight, the red spear knight, and the gold ball and chain knight. If there was ever a good time to use your Ether spell, now would be it. One blast from Ether will freeze the knights in place, rendering them helpless against your attacks. Strike at them until they collapse. If you don't have Ether, you will have quite a fight ahead of you. Try to back into a corner and swing your sword rapidly so that they can't gang up on you from multiple directions. Or you can simply avoid the fight altogether and run upstairs. When you arrive on this floor, you appear to be blocked in by a set of statues. But one statue will yield when you push it. Push the left statue over to the left and you will be able to enter the rest of the room. Waiting for you are two bow knights and a spear knight. Fight them if you wish, and move through the left door. 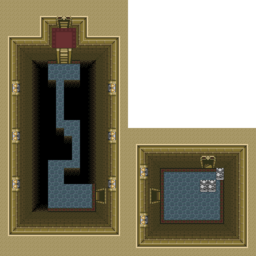 In the next room, you will be on a narrow plank that you must traverse from the bottom to the top. The knights in the room won't help matters much since you tend to get pushed back when you strike them with your sword. If you're going to hit them, make sure you won't be repelled off the ledge and plunge into the darkness. Try to use your boomerang to control the fight a little more. Once you safely make it to the other side of the room, climb the ladder and proceed through the stairwell to the final floor of the tower. You've reached the highest floor of the tower. You arrive in an empty room with four lit torches. One door above serves as the only option for you to pass through. 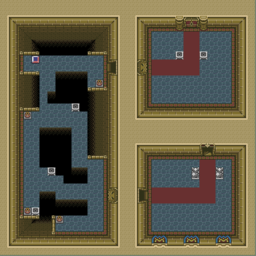 When you reach the next room, you will witness Agahnim casting his evil magic on poor Princess Zelda, warping her to an unknown location in the Dark World. You are powerless to stop him. With his evil deed done, he appears to vanish through the wall behind him. You must not allow him to escape. Taking your sword to the curtains at the center of the top wall will reveal an opening. Brace yourself and pass through the opening. In addition to the curse that Agahnim cast on you that sent you to the Dark World, Agahnim cast one more curse on the Castle of Hyrule itself. Until the day of Ganon's defeat, everyone who passed through the glorious front gates of the castle would also be transported to the dark realm. Unlike the many warp tiles that were scattered all over Hyrule, the front gate of the castle became a one way trip to the once beautiful, and now twisted Golden Land; the Dark World. This page was last edited on 2 March 2013, at 15:44. This page has been accessed 82,074 times.